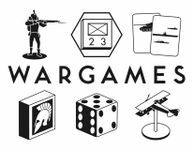 This is the subdomain for wargames. "A wargame (also war game) is a strategy game that deals with military operations of various types" (https://en.wikipedia.org/wiki/Wargaming). However many wargames cover political and strategic choices. They can simulate historical, fantasy, near future or science fiction themes. A wargame can be played on a board with counters, with cards or/and with miniature figures.